This study reports for the first time on the distribution, host preference and infection rates of malaria vectors in Mauritania. It was conducted during an outbreak of Rift valley fever. Three anopheline species were reported. An. arabiensis was the predominant species observed in all regions whereas An. pharoensis and An. funestus were observed along the south border in the Senegal River valley where extensive irrigation schemes are present. The distribution limits of anopheline species were observed from the Senegal River basin in the Trarza region up to the south limit of the Saharan desert in Tidjikja city. Overall, all An. funestus and An. pharoensis were fed respectively on human and ovine hosts whereas the mean anthropophilic rate of An. gambiae s.l. was 53%. A low Plasmodium falciparum infection rate was observed for species of the An. gambiae complex (0.17%) represented mainly by An. arabiensis. Because of the specific nature of this investigation, longitudinal studies are essential to better characterize the malaria vectors and their respective role in malaria transmission. In Mauritania, malaria is a major public health concern in southern and south-eastern regions. In fact, it is clearly on the increase and significantly contributes to the increase in illness and mortality, especially in children under 5 years of age and pregnant women . In spite of this importance, little is known about its vectors. The only published entomological studies date back 40 years [2, 3], although limited entomological investigations were conducted during an outbreak of Rift Valley fever in several localities . An. gambiae s.l. and An. funestus appear to be the dominant vectors of malaria. Their limits of distribution throughout the country are however unknown. This situation makes impossible the determination of the origin of malaria suspected cases in areas where malaria vectors are thought to be absent. One of the principal explanations for such suspected cases is that they have been imported. However, this hypothesis seems to be speculative with regards to some autochthonous cases observed . The hypothesis that there is malaria transmission by anopheline species other than those already described above cannot be excluded. In many health centres, no parasitological analyses are performed and only clinical diagnoses are made. However, with the increasing number of cases attributed to malaria and the recurrent emergence of hemorrhagic fevers, the epidemiology of malaria is still unclear. For this reason we paid particular attention to the malaria infection rates of anthropophilic species during an entomological investigation of a recent outbreak of Rift valley fever . Our survey covered 21 localities in 5 administrative regions during October and November 2003: Trarza (Boynaye, Keur Macene, Rkiz), Brakna (Aleg, Taiba, Guimi, Houdalahi, Bakhao, Boghe, Toulde, Sarandougou, Sagelmaure), Assaba (Kelebele, Tezekra, LeGrane, Hseytine) Tagant (Letfettar, Nbeika, Moudjeria, Tidjikja) and Hodh El Garbi (Tintane) (Figure 1). Mosquitoes were sampled by indoor pyrethrum spray catch method in selected dwellings in each locality. After collection, mosquitoes were sorted and identified using morphological keys. Blood meals from fed mosquitoes were blotted onto filter papers and the source was determined in the laboratory as described by Beier et al. . All mosquitoes were stored individually in numbered vials with desiccant and crushed head-thoraces tested by ELISA for Plasmodium falciparum, P. malaria and P. ovale CS antigen . The species from the An. gambiae complex and molecular forms of An. gambiae s.s. were identified by PCR according to Scott et al. and Favia et al. respectively. Localisation of the study sites. In total, 647 anopheline specimens belonging to three species were collected. An. gambiae s.l. was the most common species (92%) followed by An. pharoensis (5%) and An. funestus (3%). An. gambiae was collected in all localities visited except in Moudjeria (Tagant region) where no mosquito was collected. All three species were collected in Trarza region, but An. pharoensis was observed only in Trarza and Brakna regions. The molecular identification of the species of the An. gambiae complex has revealed the predominance of An. arabiensis. An. gambiae M form was observed only in Assaba (1/6; 16.7%), Brakna (2/19; 10.5%) and Hodh El Garbi (2/6; 33.3%). The distribution limits of anopheline species ranged from the Senegal River Valley in Trarza region up to the south limit of the Saharan desert in Tidjikja city. The predominance of An. arabiensis in the Mauritanian context is in agreement with the general distribution of this species in Africa . An. funestus was observed only in Brakna region adjacent to the Senegal River basin where its comeback was recently reported , as it is also the case in the Sahelian region of Niger . The development of irrigation schemes, following the implementation of the anti-salt dam at Diama (at the mouth of the Senegal River), has generated many breeding sites for An. funestus in this area. An. pharoensis whose vectorial role in malaria transmission was already suspected in the Senegal River delta  was found in both the Trarza and Brakna regions where large rice cultivation areas thought to be favourable for its aquatic stages are present. The analysis of blood meals from blood fed females showed that no significant difference was observed between the anthropophilic rates of An. gambiae s.l. among the five regions (χ2 = 4.57, df = 4, p = 0.34). All An. funestus and An. pharoensis had fed on human and ovine hosts respectively (Table 1). 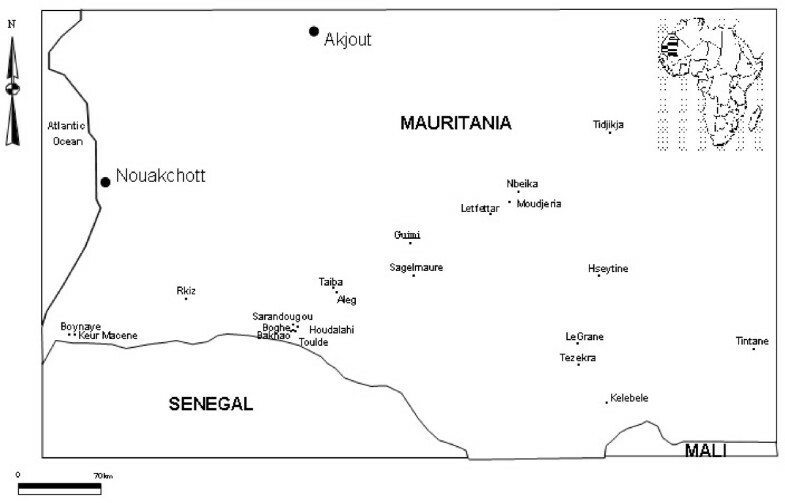 Anopheles species, resting densities, anthropophilic and circumsporozoite protein rates at different sites in Mauritania (October-November 2003). Probably because of the low sample sizes, no An. funestus or An. pharoensis was found to be positive by ELISA for P. falciparum, P. malariae and P. ovale circumsopozoite antigen detection. However, of 394 females of the An. gambiae complex tested in Assaba, one An. arabiensis was positive for P. falciparum. The circumsporozoite rate was 0.25% for this region and 0.17% for the whole study area. The involvement of these species in malaria transmission in the Senegal River basin was recently observed . This provides evidence for the possible involvement of this species in malaria transmission in this region, although the low infection rate contrasts with the suspected malaria burden in the region. To our knowledge, this study reports, for the first time, on the distribution, host preference and infection rates of malaria vectors in Mauritania. With regard to these findings, and most notably the very low mosquito infection rates, it is clearly necessary to differentiate febrile cases attributed to malaria from other febrile infections, including the hemorrhagic fevers in the light of their recurrent emergence. However, the possibility that there is transmission of P. falciparum by other anopheline species such as An. rhodesiensis and An. dthali already reported in Mauritania  and transmission of other Plasmodium species (P. vivax) cannot be excluded. Moreover, because of the specific nature of this investigation, longitudinal entomological studies are essential in order to better characterize the malaria vector populations and to identify their respective roles in the transmission of human Plasmodium. We are grateful to The Institut National de Recherches en Santé Publique de Nouakchott and Institut Pasteur de Dakar for all support during this investigation and to Pr Paul Reiter who improved the manuscript with his helpful comments. HB, SAOM and DD contributed to sample collections and laboratory processing, BL participated to the study conception and coordination, ID and MD conceived, coordinated the study and drafted the manuscript. All authors read and approved the final manuscript.